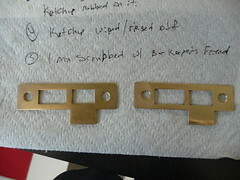 For the latest round of brass cleaning I decided to do some experimentation. 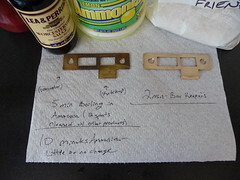 I had read that not only will boiling your brass in baking soda remove the paint, but to shine up the brass you can boil it in ammonia, rub it with ketchup, rub it with Worcester sauce, and rub it with a lemon dipped in salt to name a few. So I tried everything but the lemon since I believe that was more for cleaning copper pots anyway. 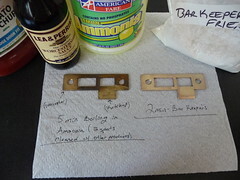 I had two lock plates both of which I began by boiling off the paint in the baking soda. 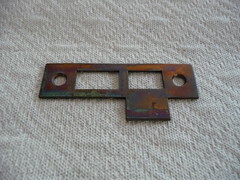 Then I polished one as I normal would using just Bar Keeper's Friend and the other I used several experiments. For simplicity sake I'll call them sample A and sample B. Both samples started out looking pretty much the same as shown below. Oh and Sample A went through the following sequences while Sample B was simply cleaned with Bar Keeper's Friend. 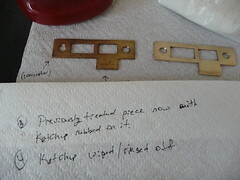 KETCHUP: I basically just swiped the ketchup on a paper towel over the brass and immediately a more golden color appeared. 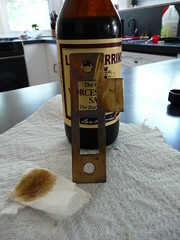 WORCESTER SAUCE: Again I wet a paper towel with the Worcester sauce and swiped it over the brass. 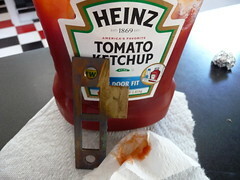 While it did clean the brass slightly, it didn't do as much as the ketchup did with the same effort. AMMONIA: Next I dropped the piece with the two semi cleaned spots from the ketchup and the Worcester sauce into a mixture of ammonia and water in a ratio of 1:8 and let it boil for 5 minutes. Upon inspection after 5 minutes, it does seem to be slightly lighter, but hardly clean. I dropped in in the ammonia again for another 5 minutes after which there was no noticeable change at all between 5 minutes and 10 minutes. KETCHUP: So I wanted to see how well the ketchup would work so I smeared ketchup all over sample A and waited a few minutes. I scrubbed it lightly with a tooth brush. Rinsed it and inspected. 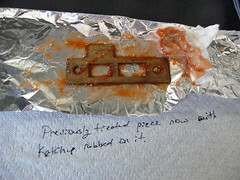 While the ketchup does indeed clean brass, it does not completely clean it. Although, if someone were looking to take blackened brass to an antique look, I'd say try the ketchup method otherwise stick with the Bar Keeper's Friend. Lastly I cleaned the piece with Bar Keeper's Friend and it has the same exact look as the one the I only used the brass cleaner on. I think I only have one more round of brass cleaning to do. 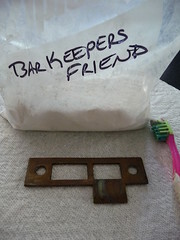 I'll definitely keep with polishing it up with the Bar Keeper's Friend.